I added a new book to my collection today, that is, a new old book. 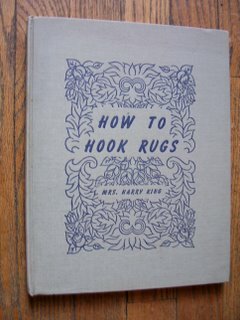 How to Hook Rugs by Mrs. Harry King was written in 1952. The combination of Helen King publishing herself as a no-name belonging to her husband and the color-by-number technique espoused in the book place it firmly in a bygone era. Just glancing through the book, I almost felt I should be wearing my white gloves and pillbox hat - but, I took myself firmly in hand and decided to look for the remarkable parts of the book - and I didn't have far to look. 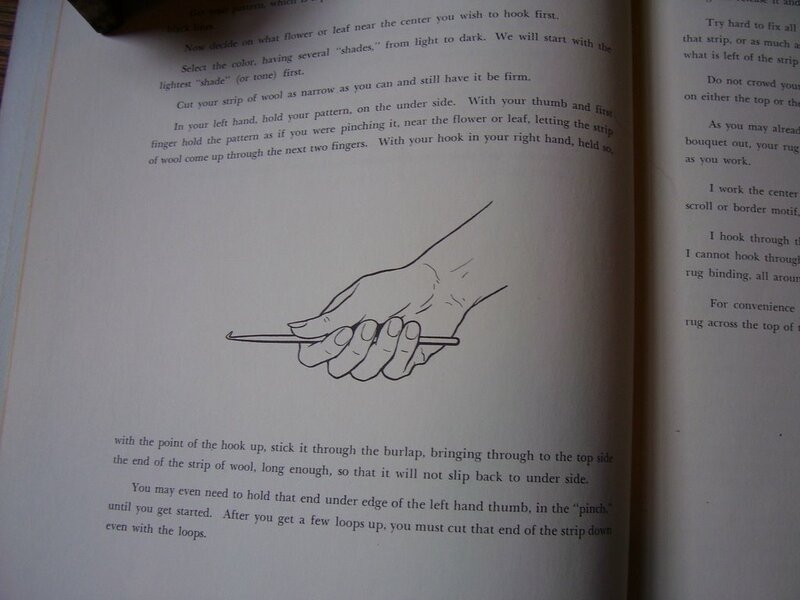 The photo shows the kind of hook Mrs. King recommends and shows the way to hold it. The hook is not described as far as size goes, it looks like any old crochet hook that might be laying around in your grandmother's sewing box. The other surprise is Mrs. King's attitude about frames - she disapproves of them. It's not that she prefers hoops over frames, she prefers using nothing. 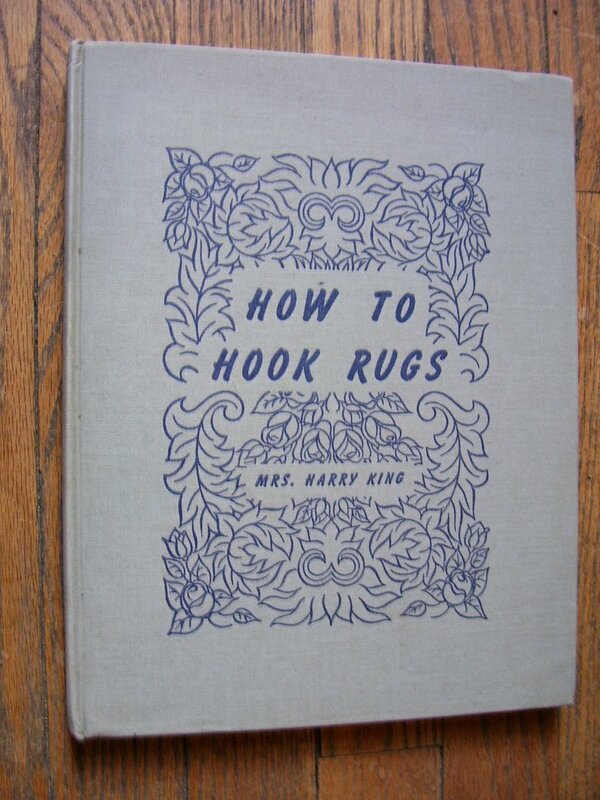 She describes hooking with only your fingers to hold the rug. 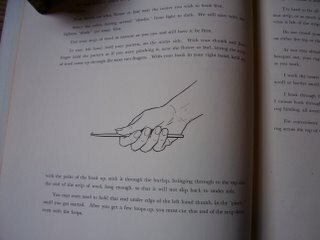 Here's how: "In your left hand, hold your pattern, on the under side. With your thumb and first finger hold the pattern as if you were pinching it, near the flower or the leaf, letting the strip of wool come up through the next two fingers." I was thinking about the heavy weight of a partially hooked rug being carried by a couple of fingers, but she solves that worry by suggesting that you might want to spread your rug out on a card table for convenience and comfort. I'm glad to have this book in my library, but as a piece of history, not as a reference. There are many pencil drawings of flowers with a number system telling you exactly how to hook each petal or leaf, and there is an index telling which pattern each flower came from, but there are no pictures of the full pattern and no reference telling anything more than a pattern name.